Nail down oak is staying cupped. : Yikes I Have Problems! Nail down oak is staying cupped. Post subject: Nail down oak is staying cupped. Hello all and thanks in advance for advice. 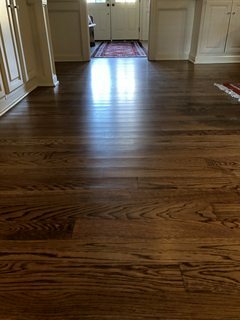 Any idea how long it will take my floors to equalize?its been a year and they still look like this. 3-1/4” White Oak nail down. Humidity in the house was very low over the winter and his fairly high now. 10%- 60%. Sub floor and slab are 10-15% as of last week. February they laid down a little. But nothing like the other parts of the floor which are so flat they look like an engineered floor. What’s in the photo was what was replaced after water damage. Post subject: Re: Nail down oak is staying cupped. I bet the subfloor was still wet when installed? Anyone meter it? Your numbers don't make sense. Or there's an unknown moisture source underneath that's affecting the area. Forgive me on the numbers, I'm going by memory as I never thought I would have problems. Laid in June 2017. Started cupping by Fall. Our Winter was very cold and dry. Humidity in the house was 10-20% all winter. By Feburary, they laid down a little. By March they were right back and have been cupped ever since. Were being told to wait further as they have not reached equilibrium. Once reached they will begin o lay down. Was aslo told if they dont lay down by September they will refinish them. The readings we took last week were at the sub floor level which I think was 13-15% and the slab level which was 10%. The humidity in the house was 60%. Where is the house located? Is there a basement below the rooms where the hardwood is? You keep referring to the slab....where is it? The humidity swings are fairly large. 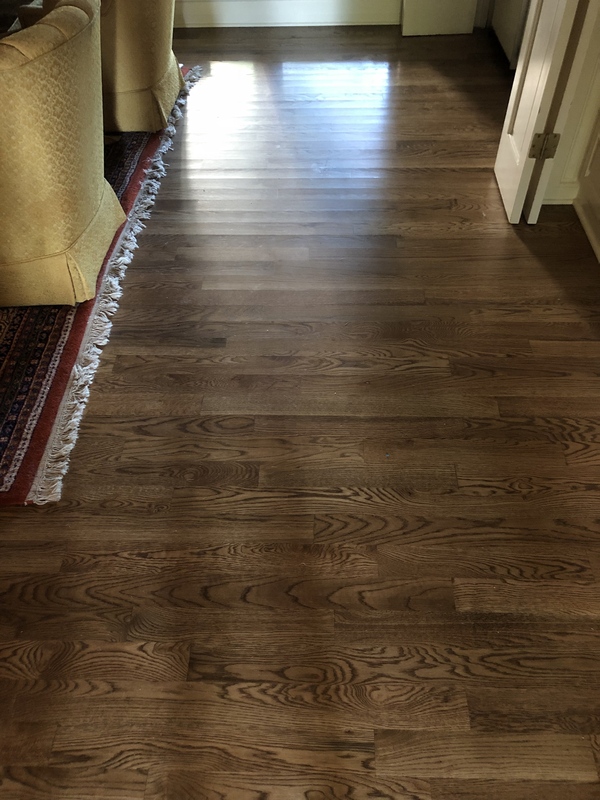 The hardwood flooring will be happiest when the humidity is kept between 40 - 50 % or 45 - 55 % year round. Mid Southern states. No basement. Controlling humidity is nearly impossible at my home. My exterior doors open and close all day. 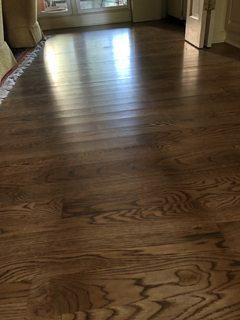 The other wood floors in my home have no problem staying flat with all the swings in temp and humidity. 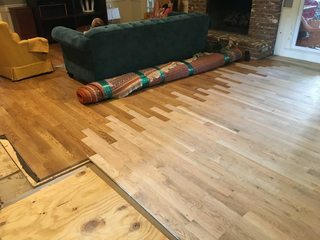 If the sub floors “plywood” was “wet” and I’m basically just waiting for them to dry, are there long term affects of the wood staying cupped for over a year? Also what will refinishing cupped floors do if they still have not laid down when we refinish? Correct me if i'm wrong but does the slab meet a wood subfloor in that first pic of the last pictures? What did they do to prep the slab and do you have a crawl space? 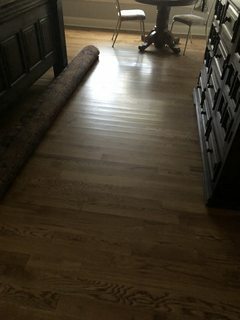 Anything to protect the hardwood and the wood subfloor from moisture? And ditto on the slab. The slab is on dirt. No crawl space, no basement. Prep was just sweeping then laid down visqueen. Why was the Visqueen placed on top of the slab instead of under it? If it is between the subfloor and slab the path of least resistance for the moisture to leave the subfloor is toward the hardwood flooring. Cupping is a moisture imbalance between below the hardwood and above the hardwood. More moisture below the hardwood and less moisture above the hardwood will result in the cupping which you have. Lowering the relative humidity in the room will draw the moisture out of the subfloor and hardwood and maybe help resolve the cupping. If cupping doesn't go away completely then sand it flat to remove the cupping and refinish. Did they nail down the plywood through the visqueen and into the slab? Yes. Plywood was Ram-Set to the slab. I think that the flooring was too dry when installed. If so, you should be good to sand smooth again, then finish and have a flat floor.